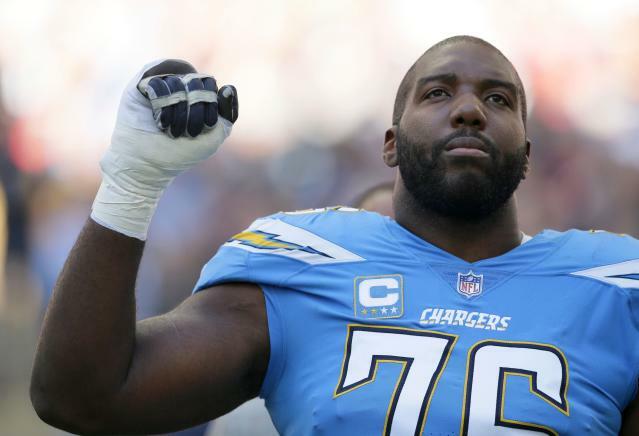 Los Angeles Chargers offensive lineman Russell Okung watched Tuesday morning as news broke that Mike Trout, the star of the Los Angeles Angels and MLB, quietly signed a 10-year, $360 million mega-extension. The guaranteed contract, common in the MLB, NBA and NHL, sent Okung to Twitter for a thread on the lack of them in the NFL. Okung is a vice president on the NFL Player’s Association (NFLPA) executive committee and posted a similar thread in July 2018. Okung’s first note is that the NFL doesn’t lack the money for it. As of January reports, the NFL brings in approximately $15 billion annually, a number that continues to climb as commissioner Roger Goodell aims for $25 billion by 2027. MLB’s record-setting revenue also continues to climb year-after-year. It reportedly brought in $10.3 billion in 2018. It can’t be due to lack of money. The NFL is the most lucrative sport in the world. We bring in 1.5x more revenue than 2nd place (MLB), which seems like an important stat on the day that Trout inks a 10 yr $430M deal, most of which is guaranteed. We help create billions in revenue, but if we get hurt and miss work, we don’t even get @Aflac type coverage. We miss work due to injuries incurred on the job -- a risk we all sign-up for, but if this is to be a sustainable partnership, that risk must be shared equitably. The league released injury data in January as well, breaking it down by year and injury type. Overall, there are an average six to seven injuries per game and many of those keep a player out for weeks at a time. While it’s easy to look at the massive contracts aging NFL stars sign, not to mention lucrative endorsement deals that bolster their earnings, most players don’t make that much or stay that long. The average length of an NFL career is about three years, per reports; That number dropped in the 2010s and is very position- and accolades-dependent. The average NFL career is 2.6 years. A 22-year-old could suffer a career-ending injury instantly. Even if he had already made millions for a few years, quick math reveals he's not exactly “set for life.” Nevermind the fact that MOST players don’t make millions per year. Salary wise the average NFL salary — which takes into account those making the bare minimum and is scaled up due to the superstar’s salaries — was $2.7 million in 2017, per CNBC data. The average MLB salary is $4 million and the average NBA salary is $7.1 million, per the site. And players in those leagues get the money whether injury befalls them or not. Some say, “Guaranteed contracts are becoming more common.” But only for very few star players. Bench players in the @NBA have more financial security than the average NFL Pro Bowl player. We need a baseline that protects everyone; that is the point of our union. Okung is focused on the NFL’s “funding rule,” which requires teams to put the guaranteed money not yet paid out in an escrow account that holds conditions. It forces teams to put the money aside all at once, giving them an excuse to simply not make the guaranteed deal at all. The Chargers lineman discussed it last summer, citing it as obsolete since billionaire owners are no longer at risk of missing payroll. Many owners cite an antiquated ‘funding rule’ that requires all guaranteed money to be locked into an escrow account. This well-intentioned rule began in the 1980’s when teams were struggling with cash-flow, but clearly this is no longer needed. Just ask the @Chiefs. The funding rule has become a go-to excuse for owners in negotiations for why they can’t guarantee contracts, as they don’t want to freeze their liquidity. Well, it seems that owners and players both agree: Let’s axe this rule. Easy win. Owners understandably need ways to hedge against unforeseen losses. But the current arrangement places a disproportionate burden of risk on players. Owners enjoy the peace of mind of being able to cut losses without having to worry about making that mortgage payment. The Collective Bargaining Agreement runs out in 2021 and these issues will be at the forefront of talks, especially given how many times the NFLPA exec has spoken out about guaranteed contracts specifically. He wrote on it in 2017 for the Player’s Tribune. Okung spent the next few hours on Twitter replying to followers’ ideas to remedy the situation. The real discussion will happen in the ensuing years as the two sides try to come to an agreement and avoid what is highly likely at this point: a lockout.